EXTRA 10% OFF with Code "BH10"
Introducing the Microzone MC Series 2.4GHz Radio Systems! The MC Series offers great performance, excellent range and reliability! The Microprocessor constantly scans for the best available channel to provide a care free flying experience without any transmission issues! It is not necessary to wait for other people while they are flying as the MC Series will always scan and choose the strongest signal channel for you automatically. You can fly with 1 or 50 of your friends at the same time without any interference! Built with quality and comfort the MC series feels great in the hand with “Fluid Feel” stick gimbals! The 1024 signal transmit rate means the instant you give your stick-input, your aircraft is responding! 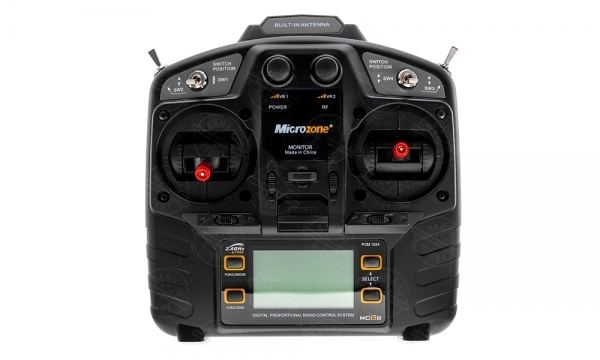 Microzone MC Series gives you more flying time and less worrying time! Fly safe, Fly fun and Fly in style! Introducing the Micro MC-8B! This stylish 8 Channel radio system packs one powerful Microprocessor! The MC-8B gives you a full 8 Channel to use on just about any aircraft, sailplane, drone, or helicopter! The LCD Backlit Display allows for easy to program and fine tune parameters such as Dual Rates, Exponential, End Point Adjustments, Throttle Curve, Flight Timers and more! The most impressive is the MC-8B 10 Model Memory! You can purchase up to 9 additional receivers and this single transmitter gives you the ability to switch from model to model by the press of a button! That’s right! The MC-8B has a 10 Model Memory Data Base! The Microprocessor will store and remember each model settings you program individually! This is still a great radio system for the beginner because of its easy to program and fly systems! However, if you are a seasoned pilot, the MC-8B can meet all your needs from sport flying, to multi-channel warbirds and EDF JETS! This will also be a great radio for Drones and Drone racing! The ability to fine tune each control surface individually meets the needs of the most advanced aircraft’s! Aluminum anodized gimbal ends and super smooth gimbals transfers the 1024 lightning fast response rate from your fingers to your aircraft instantly! The rotary dials allow for 2 channels of fluid linear controls to any dial settings you program. Take your RC experience to the next level and in style with reliability and performance with the MC-8B!